Remember when you were in Spain. Remember how everything urban there was a just a little shinier, a little buzzier, than anything we gringos can manage. The town, in Spain, is your home, as much as your living room is, and Spaniards can be a little showy about their homes. The shop windows are catchier, the architecture more dramatic, the pavements sometimes bordering on the psychedelic. Amidst oceans of cologne, pastries and ice cream, the streets smell divine. Nature simply isn’t much fun for months of the year in these dry, subtropical climes, and narrow, shady whitewashed alleys are refreshing always. Here, cities can seem like oases in summer, while country picnics are nearly impossible. To create a fitting stage for urban fun, the Spaniards over the centuries have come up with some of the sharpest tricks in the trick-bag of urban design. There’s the Plaza Mayor, a sort of building turned inside out. Surrounded by arcades and balconies, with plenty of space for cafes, it’s the perfect urban room; the original, in Madrid, was often used for bullfights. The pavement thing may have started with the Moors in al-Andaluz—intricate patterns of black and white river stones to walk on, as you can still see all over Granada. Lisbon (and later Rio) created dazzling, pop-art pavements of black and white waves, to commemorate the terrible Lisbon earthquake and tsunami of 1755. Now it’s usually artificial stone, or durable, glistening tiles in repeating patterns; it still helps make the evening paseo seem like an event. Gardens. Not every city might have something transcendent like Aranjuez, or the Generalife in Granada, but there will always be a patch of roses and fountains in the moonlight and all that is conducive to romance. But all this is only preface to another great Spanish contribution we mean to introduce right now. The alameda got its start in 16th-century Madrid, when an indecently proud and wealthy monarchy was transforming that city into the capital of a new empire. At about the same time (1574, to be exact), the Count of Barajas was laying out the Alameda de Hercules in the north end of Seville (alameda originally meant a poplar grove). 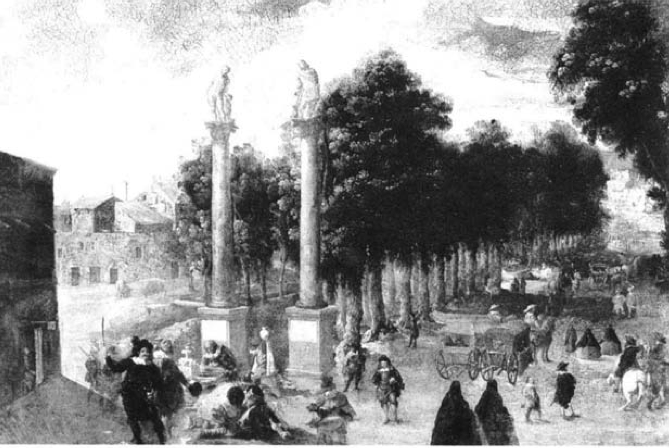 This was an elaborate, aristocratic space from the beginning, with its avenues of poplars, fountains and twin columns, recycled from a Roman temple and topped with statues of Hercules, Andalucía’s mythical founder, and Julius Caesar, who had briefly been Roman governor here. For centuries it was the place to be in Seville. Though it went down a bit, especially after the Civil War, when it gained a bad reputation as the city’s drug market, it has recently been elegantly restored, and it is regaining something of its old cachet. 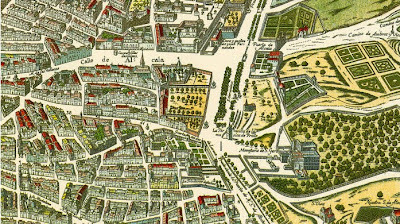 In a time when nothing like a public ‘park’ had yet been seen, the Prado and the Alameda were a sensation, and other Spanish cities soon picked up the habit, such as Burgos, with its riverfront Espolón. Over time, the form could become a city’s centerpiece; southern cities like Granada and Palma de Mallorca have pretty strings of them winding through their city centres. 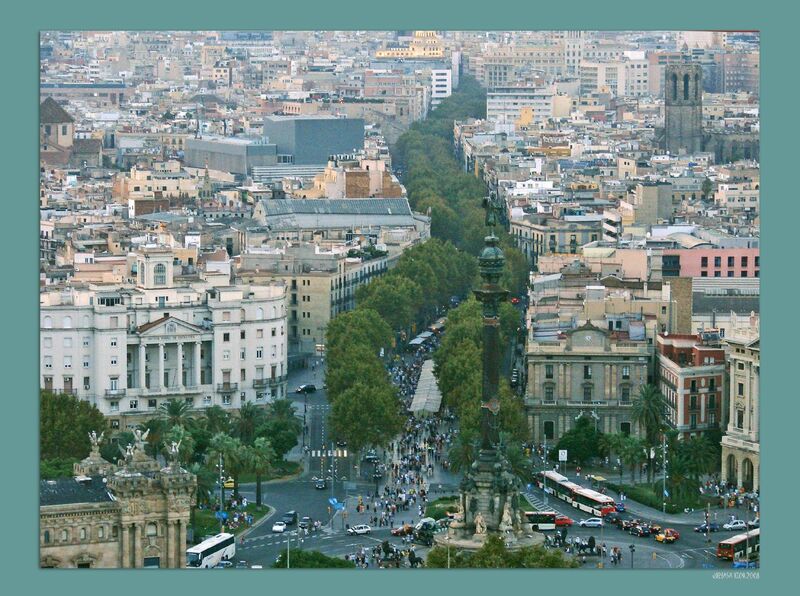 Of course, in the Catalan parts of Spain an alameda is a rambla, and Barcelona was to build the most celebrated of them all, the ‘most beautiful street in the world’, as García Lorca claimed. A ramla was a torrent or stream in Arabic, and nearly all of the Catalan ramblas cover old streams that had degraded into stinky open sewers—Barcelona’s, where tourists flock today, was once a sardonic joke, called the Cagal.lel, or ‘turd-taker’. It’s the linear nature of the alameda or rambla that makes it such a delightful urban amenity. You don’t have to come so far for the park; the park comes to you. Some benches and two shady rows of plane trees are all the decoration you require. Since it’s usually one of the main thoroughfares of town, it can take you where you’re going. And if you’re not in a hurry, you can take a seat and watch the people going by. 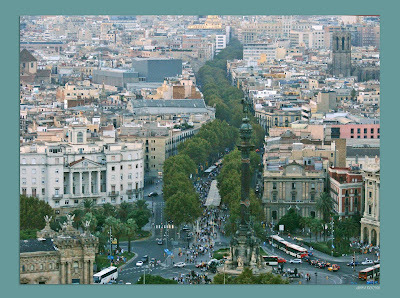 A lot of Barcelonans make a point of taking a stroll on the Ramblas every day, and in summer they secretly wish that all the tourists would go away so they could have it to themselves. They’re so fond of it, it may be the only street in the world that’s been turned into a verb: to do the Ramblas, in Catalan, is to ramblejar.